West Berlin was, for obvious reasons, a city where many political rock bands developed during the late sixties and early seventies. 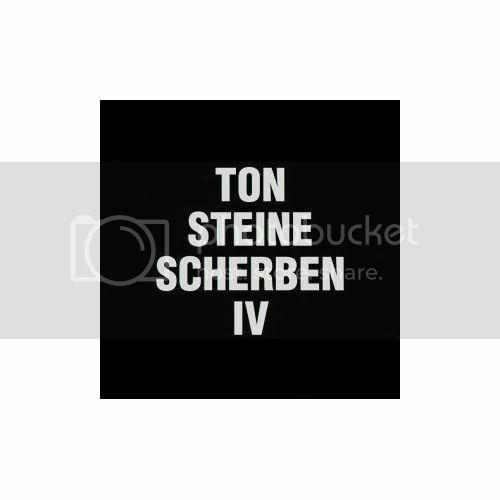 The most important artists of this movement were Ton Steine Scherben, along with Lokomotive Kreuzberg. The guiding forces of the band were Ralph Mobius aka Rio Reiser and Ralph Steitz aka R.P.S. Lanrue who first played together in the quartet Degalaxis in 1965. In 1967 Mobius was involved in the foundation of an early beat-rock-opera attempt named "Robinson 2,000". That year Mobius and Steitz also formed a theatre and music group named Hoffmann's Comic Theater. Kai Sichtelmann and Wolfgang Seidel aka Wolf Sequenza also joined this group in 1969 and 1970 respectively. A single "Macht Kaputt Was Euch Kaputt Macht" coupled with "Wir Streiken" was released in 1970. After this, Hoffmann's Comic Theater changed its' name to Ton Steine Scherben. The single sold surprisingly well and the band appeared on German TV. This, and their constant, aggressive political agitation, quickly established them as leading proponents of the Berlin counter culture. Their concerts often resulted in riots and house occupations. After a concert in Basel, the band promptly organised a demonstration against political injustice in Switzerland. The Swiss authorities honoured this action by declaring the band 'persona non grata'. The band's debut LP appeared in September 1971 on their own David Volksmund label. With very aggressive music and lyrics, partly recorded live at Alte Mensa, the band earned their reputation as the first new wave/punk band in Germany. A member of the group's living commune once finished a television-broadcasted public discussion by splitting the studio's table with an axe. Wolf Sequenza left the band at the end of 1971. In the late seventies he resurfaced with Conrad Schnitzler, making experimental electronic music. The band's next work was "Keine Macht Für Niemand", a double album which covered a much larger musical span than the debut. Jorg Schlotterer and Jochen Petersen contributed to the album. Indeed, this was a fine collection of progressive political rock, quite different to Floh de Cologne's style. After an early 1972 tour, the band temporarily withdrew from live appearances and in 1973 the only life-sign was (the reinforced) Hoffmann's Comic Theater record for children, entitled "Herr Fressack" (Rothkehlchen 1) (1973). In the Spring of 1974 they attempted a live come-back with mixed results. The audiences expected the band to be aggressive leaders of a desired, forthcoming political revolution, but were met by a band outrageously dressed in satin and velvet, who poured out glitter from the stage. However, after rethinking their stage presentation, Ton Steine Scherben was again met by acclaim. 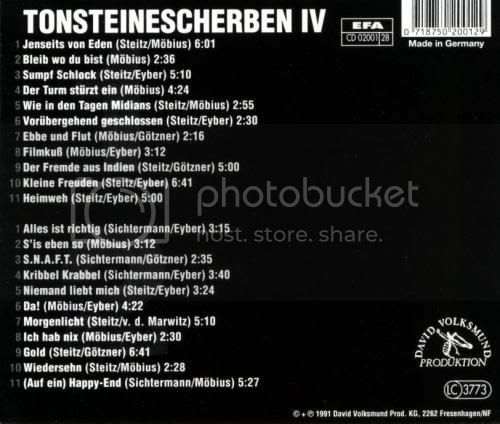 The next album, "Wenn den Nacht am Tiefsten" (1975), was another double one, taking 12 months to complete and including a lot of different musical styles. Their lyrics this time were more resigned. Along with its predecessor, this was their highest achievement. For me, their fourth album, simply called "IV" or "Die Schwarze" always was an absolute favourite - maybe the best rock album in german language. It is still a mysterious recording, with deep lyrics and a kind of strange, psychedelic, melancholic and avantgarde sounds, sometimes compared to The Clash´s "Sandinista". "Alles ist viel und viel ist nichts - luftig zu dir." There is more to come... Greetings! Moin, könnt ihr ein wenig was von Rio Reiser bringen? More Rio Reiser will be posted. Best wishes!